A unique angle on the City of Angels for the book lover, this 4-hour guided tour lets you relax on a luxury coach while you follow in the footsteps of a famous local author from youth to maturity. Whether you're a fan of Charles Bukowski, Raymond Chandler, or James M. Cain, explore the actual places where these great writers lived, worked, loved, and struggled. From their childhood homes to their favorite bars, this tour exposes pockets of the literary past that still survive in a rapidly changing city. Cool, brainy, surprising, profound. That's now how others have described these literary tours of Los Angeles. 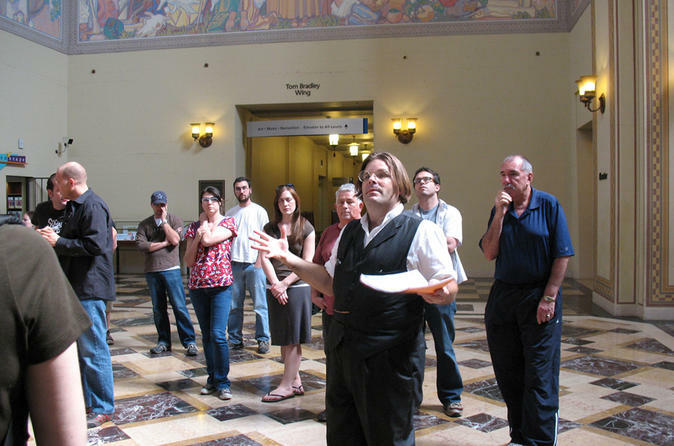 Each 4-hour tour in this series follows an iconic Los Angeles author from youth to maturity. Starting at 12pm from Downtown Los Angeles, you'll hop aboard a comfortable coach-class bus equipped with video monitors, air-conditioning, and a restroom, and enjoy the narration of expert host Richard Schave. Choose between a tour focusing on poet and novelist Charles Bukowski (Women, Post Office), Raymond Chandler (The Big Sleep, The Long Goodbye), James M. Cain (The Postman Always Rings Twice, Double Indemnity). Visit their childhood homes, favorite bars and restaurants, coffee shops, and the historic neighborhoods that inspired Bukowski's lively, rebellious novels and the moody noir of Chandler and Cain.